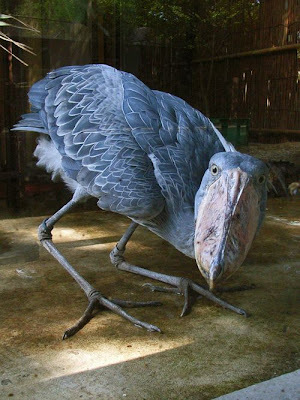 The shoebill is one of my favorite birds, though I've never seen one in person. They get very large, upwards of 115-150 cm (45-64 in) tall, with a wingspan of 230-260 cm (91-125 in). I imagine that bill can do some damage, given that it's used to scoop up and devour small crocodiles. They're even reported to feed on young calves. They were known to ancient Arabs, who called them abu markub, meaning father with a shoe. They've even been spotted in ancient Egyptian hieroglyphs. That shoe bill, which is indeed the size of an adult human shoe, is not only used in devastating attacks, but can be filled with water, which the mother uses to dowse her young in the nest. I'm not sure why she'd do that. But then, if I could fill my mouth with a couple of pints of water, I'd probably dowse all sorts of people--the kids, my wife, coworkers, passersby... I wouldn't have many friends. That bird is the raddest thing I've ever seen. Never thought I'd be introduced to my new favorite animal HERE. "I wouldn't have many friends." as opposed to now, that you have piles of them? I love this bird. It looks like something right out of Jurassic Park! That is sooooo not a bird. That is so obviously a velociraptor dressed as a bird for Halloween. Geez, look at those eyes. That thing has murder on it's mind. When you look at pics of this bird from the side, it doesn't look nearly as menacing. Head on though, whoa. Totally agree with KittyChymira, it's a disguised velociraptor. I love it! I agree with the others. Looks like it's straight out of prehistoric, dinosaur walkin times. What a cool, menacing bird. What a fun, interesting site. Congrats on being a Blog of Note. This has been a great find for a Friday morning. Oh my God! Does that really exist? OH MY FLIPPING MONKEY'S. Now I have a new bird to fear. I thought that emu's were bad enough! If that's not scary, I don't know what is.